This book contains answers to all questions in the Guided Study Book. This Answer Key Booklet is shipped free only with class-size orders (10 copies minimum) of the Guided Study Book. If you are making a class-size order of the Guided Study Book, DO NOT add the Answer Booklet to your order. We will automatically send 1 to 4 copies of the Answer Booklet depending on the order quantity. If you have ordered a copy (or less than the class-size minimum) of the Guided Study Book for your personal use, you can purchase this Answer Key Booklet without our permission. We only ask that you use your school address as the ship-to address. This ensure us that we are shipping to a teacher, and not to a student whose school is using the Workbook as an instructional material. 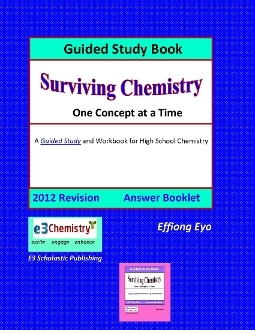 If you have purchased our Guided Study Book for personal use, please send us a quick email (info@e3chemistry.com) or use the "Contact Us" page to request permission to buy the Answer Booklet. We do this to ensure that the Answer Key Booklet is not going to students whose school is using our book as an instructional material. Thanks for your understanding.